Details, comfort and beach proximity make this an ideal and popular vacation home. The beach is just a few minutes’ walk or golf cart ride down the private drive. 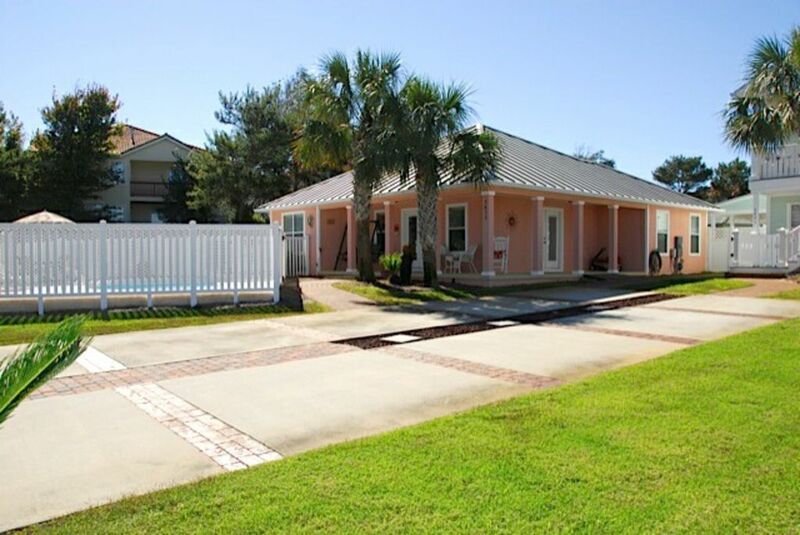 This home is one of three homes on a private cul-de-sac (Pineapple Cabana, Banana Cabana and Coral Cabana), no through traffic, close to Kenny D’s, Capt Dave’s on the Gulf and The Crab Trap restaurants on Old Scenic 98. • A Street Legal Golf Cart is available for use. Please call for Pricing Details. Must be over 25 to operate. My wife Debbie and I started this business in 2002 because of the frustration we felt in trying to find Pet Friendly vacation accommodations. We have traveled with our pets for years. Some of the places we stayed were less than clean, and it was obvious by the smell that the accommodations allowed pets. We vowed when we started our vacation rental business that all of our homes would be pet friendly and all squeaky clean. Other pet peeves (excuse the pun) is that many of the rental houses we stayed at did not have matching dishes or silverware or glasses and; the pots and pans were either dented, burned or missing. So we also vowed to include everything we could think of to furnish our kitchens including matching dishes, silverware, glasses, a full set of pots and pans, coffee maker, blender, and crock-pot. It now tickles us when we hear guests say they couldn't find anything we did not have. We think you will find our prices very competitive to other rental homes, and we believe our quality and attention to detail exceeds our competition. I'm not referring necessarily to expensive furniture or furnishings, but rather to cleanliness, comfort and tasteful decorations; and not to mention our kitchens being fully equipped. The most common comment we receive from our guests is that our homes are much nicer than the pictures portray. The greatest compliment to our effort is the increasing number of repeat guests that have turned into great friends. Nice property. Convenient! Great Host! We would give them 6 if we could! Upon entering the front door needed painting. The back door had mold on it. Patio wasn't inviting needed power washing. Bar stools in kitchen chipped and decor is tired looking. Area rug in living room needed steam cleaning. Master bedroom end tables were chipped and had water rings and a drawer in dresser got stuck. Had to pull drawer above it to get clothes out. Location was good and side yard was nice for my dog. Yard and pool maintained. Decent place needs updates. Thank you for being our guest this past January. We do understand there are some maintenance needs with the home that are normally addressed in the off season. This year however with Hurricane Michael we chose to host evacuees who lost their homes which delayed our maintenance until this Spring. This is a very popular home and we’ve always done our best to maintain it. This was an exceptional year. It was a great time and location. With the hurricane Gordon passing through the area this was still trip me and my family enjoyed and plan on going back. Perfect for a family with pets! My family and I stayed last month in the Coral Cabana and we loved it! There was plenty of room for my husband and I and our two adult children and two small dogs. The fenced-in side yard with green grass and shade was perfect for the dogs. We enjoyed the pool every day, the water was nice and warm and it was private. We rented the golf cart and drove the couple of minutes drive to the public beaches a few times and also to the community's own beach down the street. Even without the golf cart, the beach is just a short walk down the street. We plan to stay in the Coral Cabana again during our next visit to Destin and highly recommended it to our friends. Coral Cabana is located on a private cul-da-sac with two of our other homes, Pineapple Cabana and Banana Cabana. The cul-da-sac is 1,200 feet from the white sands of the Gulf Beach and right in the middle of everything. We are located in the Crystal Beach area of Destin, consider the premiere vacation spot in Destin. We are close to great fishing, golf, water parks, shopping and much, much more. Destin is located in Panhandle of Florida mid way between Panama City and Pensacola, Florida and 325 miles from Atlanta. Other Activities: Water park, go carts, bungee jumping, miniature golf, etc. Rates are based on a minimum of 6 guests, additional guests above 62 to a maximum of 8 is $105.00/wk per person plus taxes. Check-in 4:00PM, Check-out 10:00AM. Pool Heating optional Call for Current rates,A Street Legal Golf Cart is available for use. Please call for Pricing Details. Must be over 25 to operate. Pet Fees: 1st pet $140 each add'l pet is $105 (If you have more than 1 pet please contact us.) Monthly Rentals: Utilities included Prices are subject to change until the property is booked. If more than one pet please Email us.